In March last year, a group of archaeologists in Turkey made a spectacular discovery – the Gate to Hell , also known as Pluto's Gate, which was known in Greco-Roman mythology and tradition as the portal to the underworld. As if that was not enough, the remarkable finding was soon followed by the discovery of two unique marble statues which acted as guardians for the deadly cave. The ‘Gate to Hell’ which marked the entrance to a cave in the ancient Phrygian city of Hierapolis, near Pamukkale, has certainly lived up to its reputation. According to ancient accounts, the cave “is full of a vapor so misty and dense that one can scarcely see the ground. Any animal that passes inside meets instant death,” wrote the Greek geographer Strabo (64-63 BC to about 24 AD) “I threw in sparrows and they immediately breathed their last and fell.” According to Francesco D'Andria, professor of classic archaeology, who led the team that made the discovery back in March, these descriptions were accurate. The cave was described in historic sources as filled with lethal mephitic vapors and this appears to be true. It is no wonder the cave was provided with guardians to warn off any unsuspecting visitors. The two guardian statues represent mythological creatures. "One depicts a snake, a clear symbol of the underworld, the other shows Kerberos, or Cerberus, the three-headed watchdog of hell in the Greek mythology," said D’Andria. In the previous excavation, the archaeologists also found the remains of a temple, a pool and a series of steps placed above the cave – all matching the descriptions of the site in ancient sources. Dozens of lamps were also unearthed from in front of the cave opening, providing testament to the popularity of the site in ancient times, which was an important destination for pilgrims. People watched the sacred rites from steps above the cave opening, while priests sacrificed bulls to Pluto. The ceremony included leading the animals into the cave, and dragging them out dead. A reconstruction of bulls being dragged into the gate of hell for sacrifice. Image source . According to D'Andria, pilgrims slept close to the cave and received visions and prophecies, in a sort of oracle of Delphi effect. This account is also most likely true as the fumes coming from the groundwater in the cave would have produced hallucinations. These discoveries are incredibly significant because they show, once again, that the so-called myths of our ancestors were not just fanciful stories but were based on true experiences that were explained according to the language and understanding of the time. 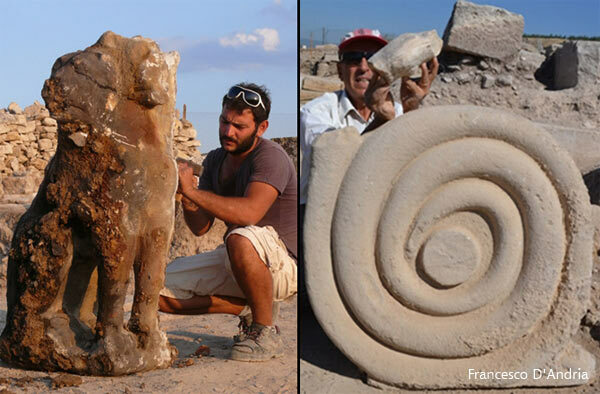 Featured image: The guardians discovery at Hierapolis. Photo source . No, the archaeologists didn't throw any sparrows in the cave. In Strabo's description of the cave, he talks about the thick mist of deadly gases, then says he threw a couple of sparrows in, which immediately died. The head archaeologist said he and his team found many dead birds and insects on the floor inside the cave. The source articles are badly worded and thus a bit confusing. It would be easy to think it was saying that the head archaeologist threw sparrows in the cave, instead of realizing that is a continuation of Strabo's description. . I agree with Henry Nixon, this is BS. "This account is also most likely true as the fumes coming from the groundwater in the cave would have produced hallucinations." Would they? How? There are a few gases to be found naturally occuring in caves and mines which might kill people or animals but not a single one of those gases would cause hallucinations. I'm going to await the findings, but really, "BadThingsHappen" are you an expert on the properties off all cave gasses on humans thousands of years ago? Have you done extensive research in the field? Why not let scientists work on debunking a story instead of jumping to conclusions based on lack of information or ignorance? It's people like yourself, and Henry Nixon, who make the internet less fun for the rest of us. just a thought, concerning any poison or toxic gas. Part of the asphyxiation process, when inhaling toxins is oxygen deprivation to the Brain; which in fact will cause disorientation and hallucinations and a host of other physical reactions. I would presume depending on the concentration of said toxins would determine how quickly the subject would subcum to hallucinations and or loss of consciousness and ultimately death. As for the distinction between a hallucination and a dream, one could argue if you had inhaled a toxin you may not be able to ascertain whether or not you were awake or asleep. How do you know if you have had a daydream or a vision? Write it down and see if it comes true? I am surprised no one has mentioned the bible's account of Christ entering the mouth of hell, I'm curious if there's a connection between this site &amp; the storey in the bible. thankyou April Holloway for all the wonderful articles I really enjoy your writing style.